The cute Alma BB is a true legend. Its pedigree can be traced to the original Art Deco icon, released in 1934. This miniature version in monogram canvas isn't impractical mini. You'll find it the right size with lots of space for all your necessities. 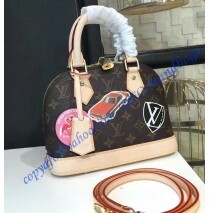 The bag is also really light-weight thus with the addition of a wallet, smartphone, keys and lipstick, it should by no means feel too heavy for either cross-body or hand carry. Having a strap which adjusts the bag to waist or hip level, the Alma BB could be carried across the body for hands-free convenience. Similar to the Kelly Bag from Hermes, or the Chanel 2.55, the Alma BB is renowned for its classy shape and celeb recognition. It'll be excellent as an evening bag as well as an occasional daily bag. Using the shoulder strap worn cross-body, the bag is getting really sporty. It's a pretty bright and practical bag. It features protective studs on the bottom, double zipper closure, and a detachable strap. In addition, it comes with the padlock and leather key tag for a bit of bag charm effect.